Today’s guest post is by Benjamin Martill and Uta Staiger, editors of Brexit and Beyond: Rethinking the Futures of Europe, and is part of a special series to celebrate UCL Press reaching one million downloads. We started working on Brexit and Beyond in early 2017 when we realised there was a distinct gap in the market when it came to easily accessible yet scholarly works on Brexit. Full-length academic articles were often too lengthy and discipline-specific to appeal to the average reader. In any case, they take a rather long time to reach the market, such that by then the real world often has moved on. Nowhere more so than with Brexit! By contrast, the readily availabile opinion pieces and op-eds through which much of the ‘here and now’ of the Brexit debate took place lacked the rigour of academic works. So we resolved to create a volume of short, accessible pieces on Brexit which would appeal to a general audience, while being informed by their authors’ long-standing scholarship. UCL Press embraced the idea with enthusiasm. We also wanted to work with UCL Press because of the benefits of the open access model. Given the acrimony surrounding Britain’s changing relationship to Europe, we felt it was particularly important to bring rigorous discussion of the topic out of the academic ivory tower. To freely provide a volume with some of the biggest names in their field to students and interested citizens alike was, we believed, the easiest – and most direct – way to achieve this. The Brexit vote highlighted a yawning gap between academic debates and the concerns of many British citizens. Meanwhile, the social media ‘echo chambers’ have contributed to divided conversations and the polarisation of viewpoints. Breaking through these divisions and starting a shared conversation on the future of Europe was our aim with this volume. UCL Press supported our book every step of the way. We had frequent meetings to discuss content, production and marketing, benefitting from the input of all the team members. The book itself came out in January and has been downloaded over 10,000 times in the past three months. What has been most heartening, though, is how pleased readers themselves have been about receiving their ‘free book’. One individual who approached us at our launch event in Brussels couldn’t believe – his words – that such a high quality product would be available for anyone to download. And, more pleasing still, he had sent copies to his friends and family. The hope is that, as more and more people engage with our contributors’ arguments, a greater number of citizens – of the UK and the EU – are brought into the detailed discussions we should be having after the referendum. Only in this way can we attempt to further the democratisation of knowledge. For facilitating these conversations – more and more every day – we are very grateful to the team at UCL Press. 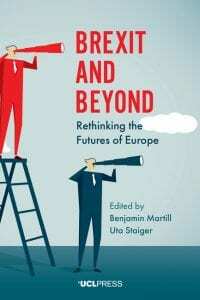 Brexit and Beyond: Rethinking the Futures of Europe can be downloaded for free here. Join us for the launch of a new book with contributions from 28 leading experts on Brexit and the future of Europe, edited by Uta Staiger and Benjamin Martill. Brexit will have significant consequences for the country, for Europe, and for global order. And yet much discussion of Brexit in the UK has focused on the causes of the vote and on its consequences for the future of British politics. This volume examines the consequences of Brexit for the future of Europe and the European Union, adopting an explicitly regional and future-oriented perspective missing from many existing analyses. Drawing on the expertise of 28 leading scholars from a range of disciplines, ‘Brexit and Beyond’ (UCL Press) offers various different perspectives on the future of Europe, charting the likely effects of Brexit across a range of areas, including institutional relations, political economy, law and justice, foreign affairs, democratic governance, and the idea of Europe itself. Whilst the contributors offer divergent predictions for the future of Europe after Brexit, they share the same conviction that careful scholarly analysis is in need – now more than ever – if we are understand what lies ahead for the EU. The panel discussion will be followed by a drinks reception. Dr Uta Staiger is the co-founder and Executive Director of the UCL European Institute. Her research examines the relationship between culture and politics, drawing together insights from modern European thought, the arts, and the history of European integration. She is particularly interested in mid-twentieth-century German theory and philosophy that seeks to straddle aesthetics and the idea of the political. Uta also holds the position of Pro-Vice-Provost (Europe), a strategic role shaping UCL’s engagement with Europe, and acting as advocate for UCL’s work on the continent. Dr Benjamin Martill is a Dahrendorf Fellow in Europe after Brexit at the London School of Economics and Political Science. His research looks at how political ideology and party politics affect foreign policymaking, with particular reference to the politics of Cold War strategy in Europe. At LSE, Benjamin contributes to the work of the Dahrendorf Forum, a joint research venture between LSE Ideas and the Hertie School of Governance in Berlin. He was previously Lecturer in Politics at Canterbury Christ Church University and Research Associate at the UCL European Institute. The editors of Europe and the World – A Law Review are delighted to announce the launch of their journal and invite papers for publication. Europe and the World – A Law Review aims to contribute to legal scholarship on the place of Europe in the world, with a particular but by no means exclusive focus on EU external relations law. As a peer-reviewed open-access journal by a renowned university publisher it makes highest-quality work promptly available to a global audience. Open-access makes individual contributions and legal scholarship more visible, accessible, and accountable. The journal serves as a forum where the national, international and EU perspectives meet and engage. The journal is therefore irreverent of traditional distinctions between EU, international, and national law. While primarily offering legal doctrinal and theoretical analyses, the journal also publishes multi-disciplinary work and political science and international relations contributions with an external perspective on the law of EU’s external relations. Papers published in the journal will be freely available online via UCL Press- issue one is now available. Please submit your paper with an abstract of about 250 words and 5 keywords (for details please see the journal’s Author Guidelines) by email to europeandtheworld@ucl.ac.uk. We are aiming for a quick revision process, which should not usually exceed 10 weeks. For all queries concerning the submission of papers please contact the Editors-in-chief at: europeandtheworld@ucl.ac.uk. Submitted papers should adhere to the format requirements of Europe and the World: A Law Review. Before your submission please visit the author guidelines for the journal. Join UCL Press and UCL Laws for the launch of a brand new journal: Europe and the World: A Law Review. Entry is free, but pre-booking is required, as this will be a popular event! Europe and the World – A Law Review aims to contribute to legal scholarship on the place of Europe in the world, with a particular but by no means exclusive focus on the EU’s external relations law. ‘Making Transnational Markets: The institutional politics behind the TTIP’, Marija Bartl. ‘The EU and International Dispute Settlement’, Allan Rosas. ‘Of Presidents, High Representatives and European Commissioners: The external representation of the European Union seven years after Lisbon’, Frank Hoffmeister. ‘(Not) Losing Out from Brexit’, Annette Schrauwen. Papers published in the journal will be freely available online via UCL Press, starting with the first issue in July 2017. Submitted papers should adhere to the format requirements of Europe and the World: A Law Review. Before your submission please visit the author guidelines for the journal at: https://www.ucl.ac.uk/ucl-press/browse-books/europe-and-the-world. Daniel Miller is Professor of Anthropology at UCL and author of 37 books including Social Media in an English Village, The Comfort of Things, Stuff, Tales from Facebook and A Theory of Shopping. Find out more about the Why We Post series at https://www.ucl.ac.uk/ucl-press/why-we-post. This post originally appeared on the Global Social Media Impact Study blog, using the title ‘Social Media and Brexit’. It has been re-posted with permission.